WORCESTER, Massachusetts — A Worcester City Council subcommittee is calling for a one-year postponement in National Grid’s “smart grid” pilot program. 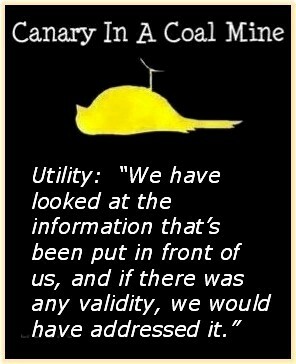 This article and video will demonstrate that the utility company doesn’t care about the canary in the coal mine … or anybody else. The three member Public Service and Transportation Committee unanimously voted Wednesday night to ask National Grid, the state Department of Public Utilities and the city Zoning Board of Appeals to consider a one-year delay in the installation of any more smart meters and the construction of any communications towers associated with the program. Committee members argued that a postponement is warranted because there are too many unanswered questions related to public health, security and privacy associated with the smart meter/grid program. Notice the language used by the utility representative about looking at information “put in front of us,” as if the utility is being fed information from an outside source to rubber stamp and not actually seriously evaluating concerns that are raised. At one point in the above video clip, Councilor Rosen speaks about how 50% of the experts think smart meters are great, and 50% of the experts think they are not so great. What the Councilor doesn’t happen to mention is that most “experts” who support smart meters are either on the industry’s payroll directly or have some other political or financial connection with the smart grid or telecommunications industry, such as through industry sponsored research or government grants. Source for News Story: The Worcester Telegram & Gazette Corp. and City of Worcester Video on Demand (VOD). 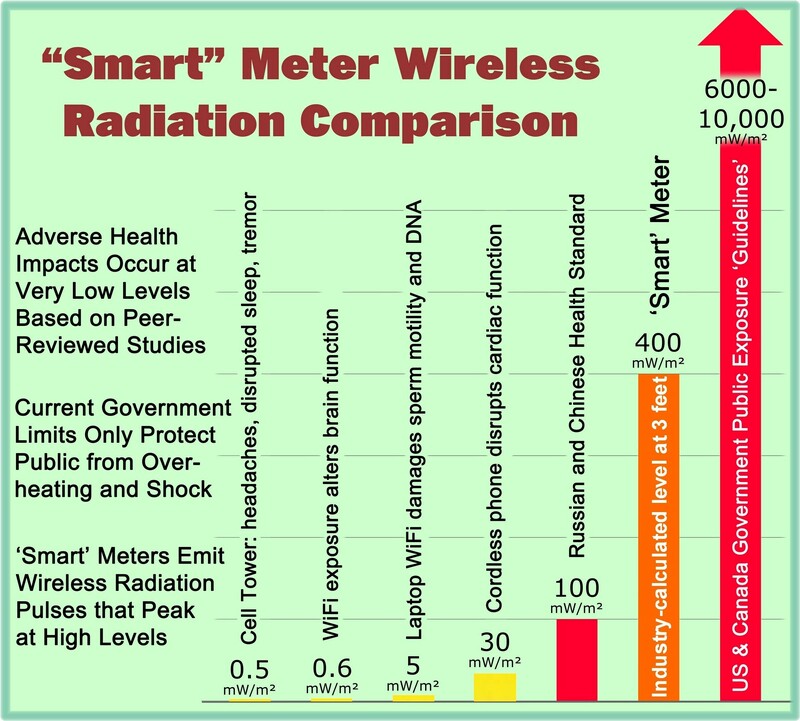 This entry was posted in Smart Grid, Smart Meters, and RF Emissions and tagged Health Effects, Massachusetts, Privacy, Smart Grid, Smart Meters, Worcester. Bookmark the permalink. Dr. Palls’ presentation, Feb 24, 2014, YouTube was relocated from the address I gave before. Here is an alternative: “Wireless Radiation Produces Health Effects by Activation of Voltage-Gated Calcium Channels”, https://www.youtube.com/watch?v=zf3ayl6c4Yw, 14:51 min. Be sure to click the ‘gear’ icon and max out the resolution to see the charts clearly. In Dr. Martin Pall’s paper, PDF, “Microwave Electromagnetic Fields Act by Activating Voltage-Gated Calcium Channels: Why the Current International Safety Standards Do Not Predict Biological Hazard”, he wrote, “EMFs Act by Activating of Voltage-Gated Calcium Channels (VGCCs).” He reports a fact; not a maybe. It is likely that there are other avenues whereby EMFs, WiFi, are producing the effects that people are in fact experiencing, but this much is established concerning their activation of the VGCCs. Pall wrote, “The author [himself] showed in a recent review (7), that in 2 dozen studies, EMF effects on cells and organisms could be blocked by calcium channel blockers, agents that block voltage-gated calcium channels (VGCCs; also known as voltage-operated, voltage-dependent or voltage-regulated calcium channels). In each of these two dozen studies, all [ALL] of the measured effects were greatly lowered by the calcium channel blockers, suggesting that activation of these channels is responsible for most if not all of the EMF effects (7). In most but not all cases, it was L-type VGCCs that were primarily involved.” Clearly there are different types of VGCCs and as regards the precise biological effects and the range of effects being seen and experienced relative to EMF exposures, these types and effects need more research and elaboration; but the fact of EMF activating key regulatory features via the VGCCs throughout the body is not in question. Hence, about the scope and nature of the effects and ramifications of this VGCC activation Dr. Pall wrote, “Activation of these channels is thought to produce most biological effects through increases in intracellular calcium levels.” He then lays out the biochemistry of the possible pathways ensuing from this intracellular rise in calcium, both as it comes about normals for regulation of functions and when turned on arbitrarily, hyper-activated by abnormal factors such as by EMFs. In my opinion this disruption to key cellular and biological functions is more than enough to stop us in our tracks and force retreat from this. We have proceeded blindly with WiFi and this path is dangerous. As I wrote before, Europe is smelling the coffee and waking up. We need to do the same. We don’t need to run into a tree to know that we’re off the road. The signs are clear. Four public libraries in Paris plus their National Library have removed WiFi, just for instance. This wasn’t some whim and they aren’t alone in what they do. http://lavieverte.wordpress.com/2008/05/23/public-libraries-in-paris-shut-down-wifi-in-response-to-health-worries/ See again http://www.cellphonetaskforce.org/?page_id=128. footnote: (7) Pall ML 2013 Electromagnetic fields act via activation of voltage-gated calcium channels to produce beneficial or adverse effects. J Cell Mol Med 17:958-965. Breaking scientific news on WiFi. The main bioactive mechanism triggered by wireless WiFi has been identified: It activates the voltage-gated calcium channels that governs all kinds of functions in the body. Here’s my Letter to the Editor that explains and directs reader to a YouTube on it. It is confirmed. The main mechanism is now known whereby WiFi emissions interfere big time with our biology and with that of animals, the birds and bees. WiFi causes trouble by activating the “Voltage-Gated Calcium Channels” or VGCCs located in cells throughout the body. VGCCs regulate myriad functions and this explains the scope and seriousness of ill effects from WiFi exposures. Here’s the starter list: Oxidative stress, breaks in cellular DNA, cancer, male and female infertility, blood-brain barrier breakdown, loss of melatonin, insomnia, autism spectrum disorder, heart arrhythmias, tachycardia, sudden cardiac arrest. Search for “Dr. Martin Pall, Oregon House of Rep YouTube” to see Dr. Pall’s brief, clear presentation of his work on February 24, 2014 (60 minutes). His article in the Journal of Cellular and Molecular Medicine was honored at “Global Medical Discovery” as one of the top medical publications of 2013 – rightly so. I suffer ill effects; I know so many other people who do, too. Dr. Pall says that the conditions known to be caused by WiFi “could not possibly occur if the current safety standards were correct.” The safety standards are NOT correct. It isn’t hopeless. Places in Europe are leading the retreat, regrouping, getting grounded. ➔ We’d better get our butts in gear, too. + The direct link to Dr. Pall’s presentation is https://www.youtube.com/watch?v=E-nYxZHak6I. “On 27 May 2011, the Committee on the Environment in the Council of Europe [Parliamentary Assembly] unanimously passed a position paper on “The Potential Dangers of Electromagnetic Fields and Their Effect on the Environment.” The paper refers to its past work on environment-related health hazards concerning the right to a healthy environment and now recommends immediate action by its member states to protect the public from the harmful effects of EMR sources, such as cell phones, WiFi, baby monitors and other wireless technologies.